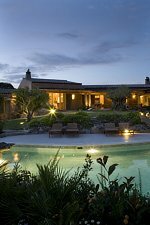 A luxury hotel immersed in one of the most beautiful sceneries of Sardinia. A stone's throw away from 18 sandy and secluded coves. Thalasso Spa Centre. Mini Club and child care from the age of 3. This **** Hotel Village built near mile-long white sand dunes has 4 swimming pools, 6 restaurants, tennis courts, sailing school, horse-riding centre, miniclubs and playground. Near Palau, Bay of Arzachena. Relaxing **** park hotel overlooking secluded beach, set in wonderful natural surrounding – an ideal place for nature lovers. Many lovely walks and horse riding treks. Pool, miniclub and bar/restaurant. Diving centre and windsurfing nearby. 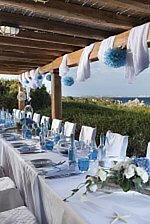 Secluded romantic hotel situated by white sandy beach in a truly magical spot. 35 rooms with magnificent views. 2 swimming pools. Beautiful restaurant renowned for the quality of its food. Scuba diving, horse-riding, boat excursions and private pontoons. Cannigione, North East Coast. Walk to beach and to village. Splendid hotel with children facilities now also with self catering apartments. 2 swimming pools. San Pantaleo, Buddeo, Sardinia. Heated swimming pool. 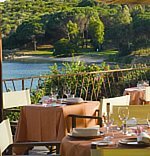 A charming boutique hotel hiding amongst the granite rocks of the Gallura with grandiose sea views. Pure to the senses and reenergising. Petra Segreta Wellness Resort is located in the splendid high valley of Buddeo. It has a spectacular view of the Gulf of Arzachena, the Island of Caprera, the Island of Maddalena, and Corsica. The Wellness Centre has a Turkish bath, sauna, Jacuzzi, fitness centre and relaxation area. There is direct access to the outdoor heated swimming pool with Jacuzzi. An elegant 5 star hotel situated just a few hundred metres from the romantic Marinedda beach a white stretch of soft golden sand. The excellent services and facilities of the hotel including a lush SPA create together with the peaceful private location an enticing setting for wellness and relaxation. The hotel is in an idyllic location. Beaches near by. Terraces, air conditioning, satellite TV and fridges. Large swimming pool, solarium, mini-club and 2 restaurants. Spa facilities include a 2nd pool, Turkish bath, sauna, gym, thalassotherapy, massages and beauty salon. Santa Margherita di Pula, South Coast. Suites and villas on the beach. Exclusive and peaceful hotel built in unspoiled truly enchanting surroundings by a sandy beach. Encircled by lush private park, it has pool, restaurant, fitness room, windsurfing, tennis, horseriding, boat trips. Playground and babysitting. Golf. Wonderful complex consisting of 7 hotels and 5 suites in 25 hectare park. Facilities include 14 restaurants, salt and fresh swimming pools, 12 lit tennis courts, football pitch and go-cart track.